Rise to the challenge of climbing Japan's famous Mt. Fuji in the cold conditions of the springtime with IFMGA certified mountain guide Norihide. Mount Fuji (3,776m) is Japan’s highest peak. It is also often used as a symbol for the country. While it is more popular to climb in the summer because of better weather conditions, on this trip, you will climb Mt. Fuji in the springtime. During the spring, at the mountain’s peak, temperatures can get as cold as -20 degrees, and winds can sometimes hit 100km/hr. So while the climb itself isn’t technically difficult, you will have to be properly prepared for the chilly conditions. Therefore, you should also have prior winter mountaineering experience before going on this climb. There are two possible routes for the climb. They are both 2 day routes. They are the classic route and the Gotenba route. The classic route, which is less strenuous, starts at Kawaguchiko station. From there we will drive to Fujiyoshida Umagaeshi (1,430m). After that we will hike up to the Sato hut (2,230m), where we will spend the night. On the second day, we will climb to the summit before making our way back down and returning to Kawaguchiko station via Fujiyoshida Umagaeshi. The Gotenba route also starts at Kawaguchiko station, where you will stay in a nearby hotel for the night. On the second day, early in the morning, we will drive to Gotenba 5th station (1,440m). From there we will make our ascent to the peak of Mt. Fuji before making our way back down the same day and returning to the hotel for the night. Please send me a message if you want to join me to the summit of Mount Fuji, Japan’s most famous peak, during the spring season. And if you are looking for another physical adventure in Japan, I also offer a 2-day ice climbing trip in Yatsugatake. Gear rental, Kawaguchiko hotel cost, and Guide Hut cost (JPY 8,500 split by no. of participants), Guest Hut cost (JPY 8,500 per person) is not included in the price. The Sato hut for the classic route, or a hotel near Kawaguchiko station for the Gotenba route. Participants should own or rent Goretex hardshell jacket/pants, winter mountaineering boots, ice axe, crampons and helmet. In April, the Sato hut will not open unless there are more than 5 people staying inside. If that is the case, the Gotenba route will be taken, which does require a higher fitness level and is a different price. If you do not have much winter mountaineering experience, I also offer a one-day winter mountaineering course that will properly prepare you for the classic route. 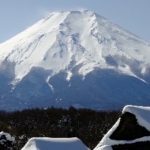 Climbing Mount Fuji is subject to weather conditions as well as technical, physical and suitability of the participants. I was born in Hakuba village in Nagano, Japan, to a family of ski instructors and mountain guides. Through my childhood, I'd been active in skiing and all mountain activities, and competed in alpine skiing until graduation from high school. I then travelled to the French alps where I spent the next 5 years learning the skiing and mountain guiding techniques and skills. 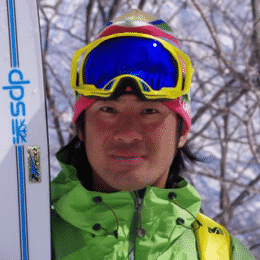 During my stay, I also worked as a ski instructor in Chamonix, France and upon my return to Hakuba, taught at Iwatake ski school as well as coached the Alpine ski racing team at a high school. I am an IFMGA guide and my climbs abroad extends from notable peaks in Europe, Africa, South America, Nepal, South Korea, Thailand, and also a first ascent (named Mt Ashura) in China. I am also a member of Nagano mountain rescue, as well as participate in development of new mountain guides and new mountain gears. Currently based in Hakuba village, my guiding encompasses high altitude mountaineering abroad, and ski instructing, backcountry ski guiding, free climb guiding, and ice climbing guiding domestically. Come visit and see the natural beauty of mountains in Hakuba area, where I grew up! You’re very welcome to stay and base your excursions at the lodge that my parents run too.